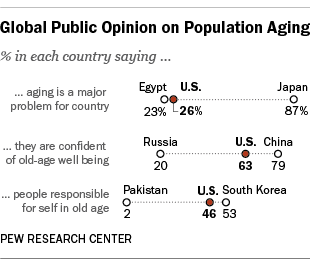 Americans may have another reason to feel more confident than others about their demographic future: the U.S. is aging at a comparatively slow pace. 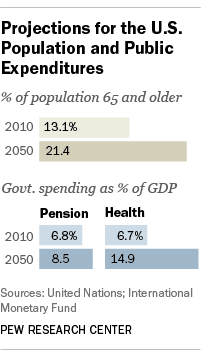 The median age in the U.S. is expected to increase from 37 in 2010 to 41 in 2050. Meanwhile, a greater increase is expected globally, from 29 to 36, and most people in South Korea, Japan and Germany are expected to be older than 50 by mid-century. It is possible the public has heard the alarm bell but believes that corrections will be made. Although it is difficult to anticipate the choices individuals might make in the future, Americans may plan to boost their retirement savings. And family structures may be evolving to adapt to the needs of the elderly, perhaps through growing numbers of multi-generational households. The future state of public expenditures also need not be gloomy. The principal driver of health care expenditures is cost inflation and reining that would significantly brighten the long-run outlook for Medicare and Medicaid. The Congressional Budget Office has also estimated that gradually raising the full retirement age for Social Security to 70 for people born in 1973 or later (it is currently at 67 for people born in 1960 or later) would reduce federal outlays on the program.